Malaysia Airlines Flight 370 disappearance is unlike anything in aviation history. What has happened to Malaysia Airlines Flight 370 is unlike anything we’ve known before. Air traffic controllers call up pilots to give them instructions, inquire about their intentions, and relay information. Above, the cockpit of an Airbus A380 in 2012. As the disappearance of Malaysia Airlines Flight 370 stretches on with still virtually no reliable clues to work with, what began as a bizarre incident is beginning to look even stranger still. Commercial airliners have gone missing before, but only until their wreckage was found. MH370 seems literally to have vanished into thin air. But how could that happen? And what does it mean for a plane to disappear, anyway? 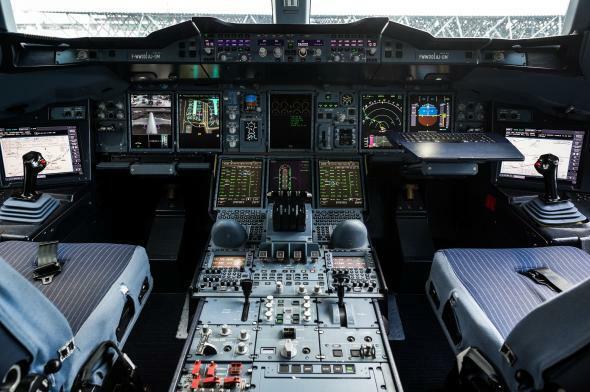 The shock generated by the Boeing 777 mystery is largely a product of how much we’ve come to take for granted the modern superabundance of information. We expect to know where everything is, all the time. If you log on to a flight-tracking website, you can punch in the flight number of any commercial aircraft and see its current location and direction. Seems pretty foolproof. And indeed, in most cases, airplanes are constantly connected into the global information network by multiple mutually redundant forms of surveillance and communication. There’s very little uncertainty—which is how air traffic controllers like it, since streams of large metal objects moving at hundreds of miles per hour don’t do well moving randomly around the sky. For air traffic control purposes, the planet is divided into regions called “centers,” each of which is under the authority of a different set of controllers. Every plane begins its travel through the system with the filing of a flight plan, and as it proceeds on course through the air, its information moves along electronically in parallel from one center to the next. Centers track each flight in a variety of ways. The first is with good old-fashioned radio calls. Controllers call up pilots to give them instructions, inquire about their intentions, and relay information. The second source of information is radar, of which there are two kinds. Primary radar tells operators where a plane is located. The military uses a version that can also tell at what altitude a plane is flying, but civilian controllers don’t have access to that kind of system. Instead, they use secondary radar, which pings an electronic device called a transponder inside each aircraft, which then transmits its altitude. Controllers will then be able to see on their screen the number of each flight, its location, and its altitude, derived from secondary radar. Radar and radio have been used since your grandparents’ day. More recently, a third system has started rolling out called ADS-B. The acronym stands for “Automatic dependent surveillance-broadcast.” Aircraft determine their position via satellite navigation, then transmit that information to a base station. They can also receive information from the base station, including weather info and the location of nearby traffic. It’s a better system than secondary radar and someday will supplant it, but for now we’re in the transitional phase, and in most cases pilots and controllers have access to both. Together, these last two systems provide a robust and interlinking network, but they share the same limitation: They’re limited in range to somewhere between 100 to 200 miles from the nearest ground station, depending on atmospheric conditions. * “In general, once you go far enough out over the water, if you don’t have a satellite link, there’s no way to talk to the ground,” says Rob Thomas, a program engineer with Ohio University’s Avionics Engineering Center. In such cases, the flight remains in the system, and controllers continue to see its symbol moving across their screens, based on the information obtained from the flight plan and from the last actual contact between controllers and the plane. In a sense, then, you could say that planes disappear all the time: They’re out of contact, and their status within the system is based on assumption until they can actually get back in contact and confirm that everything’s A-OK. In the overwhelming majority of cases, the system works just fine, and everybody turns up more or less where they’re supposed to. But sometimes it doesn’t. In the early morning hours of June 1, 2009, controllers in Senegal watched Air France Flight 447 progress across their screens for more than two hours. They hadn’t managed to communicate with the flight but assumed everything was all right. It wasn’t. The plane had actually plunged into the sea hours before. Not until an inquisitive controller in the next center over began asking questions did the authorities realize that something was amiss. Likewise, it wasn’t the disappearance of Flight 370 per se that sparked concern, but its failure to reappear. Forty minutes into its flight, soon after it leveled off at 35,000 feet and turned to the northeast as planned, its ADS-B signal winked out. That’s not unusual. According to flight tracks available at Flightradar24.com, the plane often loses its ADS-B signal around that area. Depending on atmospheric conditions, it might lose its secondary radar coverage as well. But its virtual track within the air traffic control system continued. It wasn’t until the flight failed to establish communication with controllers in Vietnam that the red flag went up. Not only had Flight 370 disappeared, it had vanished. There’s a fourth source of information about airliners that’s a bit more obscure, because it isn’t visible to air traffic controllers. ACARS stands for Aircraft Communications Addressing and Reporting System. It’s a way that aircraft can communicate automatically via telex-style messages with an airline’s dispatch and maintenance offices. Depending on the service, a plane’s computer can transmit anywhere from once a minute to every half-hour, and because satellite communications are used, the messages can be sent from anywhere in the world. After the authorities realized that Air France Flight 447 had disappeared, they went back and retrieved the plane’s final ACARS transmissions, which revealed that the plane had experienced a cascading series of problems just before it was lost. ACARS provided the first clues that eventually led to the unraveling of the whole mystery. In the case of Flight 370, however, the airline has stated that the ACARS reported nothing unusual. They haven’t been any more forthcoming than that, however; it’s not even clear how often they were receiving messages, or even if it was turned on. At this point, either remains a possibility, given the scarcity of clues. Past air crashes have always turned up some definitive evidence by this stage of the proceedings. This incident (frankly, we’re not even 100 percent sure it is a crash) is different. So far, no debris field has been found, the Pentagon reports that it detected no midair explosions in the area, and Malaysian authorities have issued contradictory statements about what primary-radar tracks they may or may not have observed. Based on the vast search area, it appears that authorities believe that the plane may have been deliberately flown far from its original heading. If that’s the case, then whoever redirected the plane might well have timed its abduction to coincide with the period when it would have slipped out of sight of the air traffic control system anyway—presumed to be operating normally, but actually veiled in the fog of unknowability. That would take a savvy operator, to put it mildly. So was it an inside job? That seems like a far-out conjecture, but then again, the one thing that seems clear is that Flight 370’s circumstances are unlike anything we’ve known before. In one of Arthur Conan Doyle’s most famous lines, he has Sherlock Holmes observe: “Once you’ve ruled out the impossible, whatever remains, however improbable, must be true.” What this dictum fails to take into account is that the world includes many eventualities that our imaginations have so far failed to register. Correction, March 12, 2014: This article incorrectly stated that all radio waves are limited in range to somewhere between 100 and 200 miles. Airliners are also generally equipped with high-frequency (aka shortwave) radios that have essentially unlimited range, which makes it generally possible to contact planes even over the middle of the ocean, though this doesn’t always work.